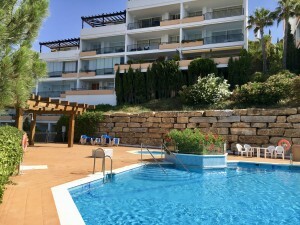 Beautiful apartment with sunny terrace and sea views, located in an exclusive, quiet and safe urbanization in the centre of Torremolinos and near to all services.. Living room with access to the terrace, equipped kitchen with access to the terrace, 2 bedrooms and 2 bathrooms. Master bedroom with en suite and access to the terrace. Large terrace with storage room, sunblind and pergola. Property in very good condition with marble floors, wardrobes and pre installation of air-conditioning.Two garages and a storage room included in the price. Very well maintained community with large garden, swimming pool for adults and children. Total build size 108,09m2. Living area 79,53m2, more terrace of 28,56m2. Community 94,03? per month. IBI 664,63? per year. Train station and Centre of Torremolinos 500mts.